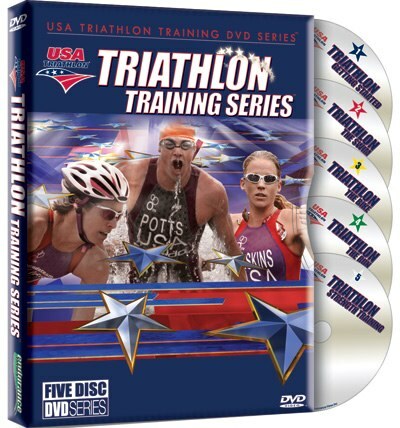 From Triathlon's national governing body comes the first-ever training series produced officially by USA Triathlon and Team USA. This dynamic, comprehensive 5 DVD series covers every facet of the sport and features some of the world's most renowned talent! Perfect for the serious beginner to advanced triathlete. From the Olympic Training Center in Colorado Springs, 2007 USAT Coach of theYear Mike Doane and U.S. Olympian Andy Potts illustrate proper swim technique, drills, pool/open water swimming strategies and more. One of the world’s leading running coaches, McGee breaks down the mechanics of running to help athletes achieve peak run performance. There is a distinct difference between running and running for triathlon. Learn how to incorporate essential form drills and strengthen running specific muscles to help you run faster off the bike! From the top in the field, 2008 Olympic Team Trainer Bob Seebohar reveals cutting edge, safe and effective strength and flexibility methods designed to enhance triathlon performance. Learn how and when to incorporate periodized strength training into your overall triathlon training plan.